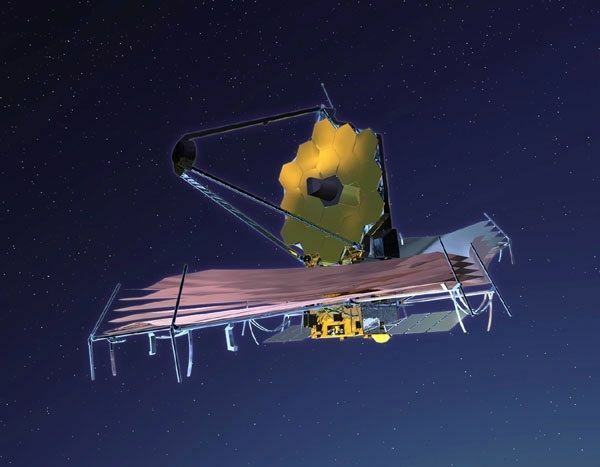 The James Webb Space Telescope will be launched into space in 2018. It will be placed into an orbit 1.5 million kilometres above Earth in such a way that it will be in constant alignment over the dark (nighttime) side of the planet. Protected from the heat of the sun, earth and moon by a sunshade as large as a tennis court, the telescope will be maintained at a temperature lower than -220°C. However, it is too far to be repaired and maintained by astronauts, so its life span will only be 5 to 10 years. The observatory bears the name of James Edwin Webb, director of NASA from 1961 to 1968. It is the product of a collaborative effort between the United States, Canada and Europe. Canada is committed to providing a fine guidance sensor and an imaging spectrograph for near infrared. These two instruments will be delivered to NASA in 2012 and will be integrated to the telescope. John Hutchings, an astronomer with the Herzberg Institute of Astrophysics, is Canada’s Project Scientist. At 6.5 metres in diameter, the mirror of the telescope will have a surface seven times greater than that of its predecessor, the Hubble Space Telescope (2.4-metre mirror). The mirror will consist of 18 small hexagonal mirrors that will deploy and fit together once the telescope is in orbit. The entire observatory will weigh 6,600 kilograms. The telescope will operate at wavelengths between 28 thousandths to 6 millionths of a centimetre: that is, from the mid-range of the infrared to almost the beginning of visible red light (Hubble, in contrast, observes at ultraviolet, visible and near-infrared wavelengths). This range of wavelengths will make it possible to detect extrasolar planets, to conduct detailed studies into the formation of planets and stars, and to study the oldest galaxies lying at the edges of the Universe. René Doyon explains what the James Webb Space Telescope is. René Doyon is the Director of the Institute for Research on Exoplanets and Observatoire du Mont-Mégantic. He is also the principal investigator for NIRISS, one of four scientific instruments on the James Webb Space Telescope. The James Webb Space Telescope is the successor to the Hubble Telescope. It's a 6.5-metre telescope that will have 8 times the collecting surface of the Hubble Telescope. It will be sent into space at a distance of about 1.5 million kilometres beyond the orbit of the Moon, at what we call the second Lagrange Point. At this position, background radiation is very, very low, and the telescope will be specially designed for infrared observation. The telescope itself will be cooled to cryogenic temperatures; that is, at 30 Kelvin (-250 degrees Celsius). Canada is an important partner in this telescope. Canada is providing a piece of scientific equipment called the Fine Guidance Sensor. This instrument has the crucial role of maintaining the extremely precise aim of the James Webb Telescope.